Cottage Elements: Chalk-up Another Junk Reuse! As you saw in my Christmas Tour post, I recently painted a wall off my kitchen in chalkboard paint. I used a Rustoleum product that is tintable, I chose the grey, but it also comes in a wide variety of fun colors. An added note, I also found online you can make your own. But me, I like the easier choice. This is what I started with. Practical, but not too appealing. With twigs added to give a little more interest, a few old keys hanging from it adds to the cool junk look! Being magnetic, it also serves as a note holder. A small juice glass holds the chalk. If you've ever seen my past posts, I collect the number seven. What a perfect embellishment to the "junk" I found to hold my supplies. Now we won't forget to go to hockey games! As if my daughter would ever let me forget! Looks like the troup is wondering what mama's up to! 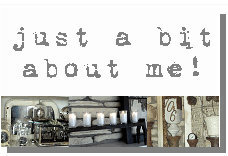 To see more of my JUNKMARKET projects, click on the link on the side of my blog. Thanks to Amy of Whisperwood for sponsoring this chalkboard linky party! And to Kev & Layla Palmer for their "How To's Day"! I just found your site while I was crusing around over at The Little Green Bean. I love all of your ideas!! I never thought about collecting just one number. How cool?! I am your newest follower and will come back often! I've been following for a while and this is absolutely one of your best ideas! Love the dustpan..what a great re-use of "junk"!!! I, too, have a chalkboard wall and I am SO going to be on the hunt for something vintagey to hold chalk, magnets, etc. :) What a great idea! This is just stinking cute! Love how you embellished too! Hope you're staying warm. Dang it, it's cold here. This is great and I had not seen gray chalkboard paint before. Love the look. New follower! I LOVE your style! I can't wait to check out the rest of your blog! That is really cute! So funny it is a dust pan. Good job. I found you on the Chalk talk link party. I would love for you to link this up to my Organizing Mission link party. I love having organizational ideas that are DIY! Oh...I'm on WP, not on blogger. I don't like leaving links, but I'll be hard for you to find otherwise. You can go to organize with sandy.com/blog and look for my Organizing Mission link party week 18 is still open. I really love those home made magnets you made. I'd love to read how to make them. I like how your cats are taking over your house. They seem to think they are boss there. A Look at My Most Popular Posts! From Corbels to Curtain Rods! It's a Dilly of a Sign! Doesn't Matter if it's Black or White . . .
Want to know a little about me? Click below to view my profile or to email me. My On-Line Holiday Home Tour for 2010! Please do not reproduce, use, or copy my images or text without my express permission. 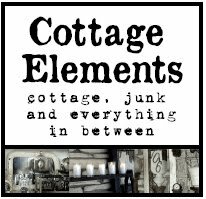 For permissions about blog content use, please email cottageelements@aol.com. Grap My Button...Share the Fun! JUNKMARKET Style - With over 35,000 members strong and still growing! I'm "Senior Editor" on this creative and inspiring site. Check it out and be sure to become a member! 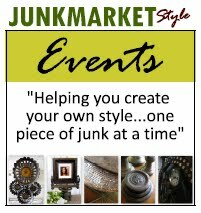 Keep up-to-date on all our JUNKMARKET Style Events! I'm Back With Big News! For More DIY Inspiration visit Amy! ©Cottage Elements 2010. Powered by Blogger.